We have to do some Mud Play outside instead. 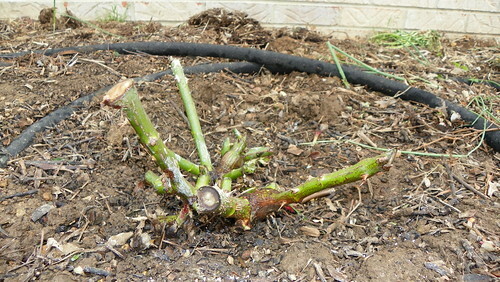 We painted all the cut branches with wood glue to prevent intruson into the plant by The Baddies. We raked out the dead leaves and fertilized, watering it in. 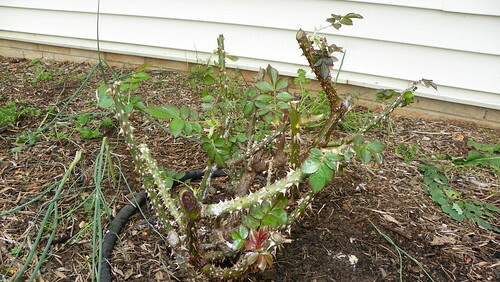 This is a heavily pruned and cut back Coral Drift rose. 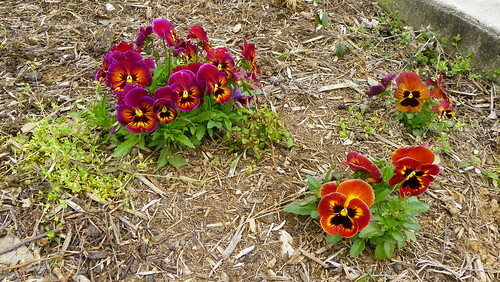 It’s description led me to believe that they were much smaller and more disease resistant than they proved to be. 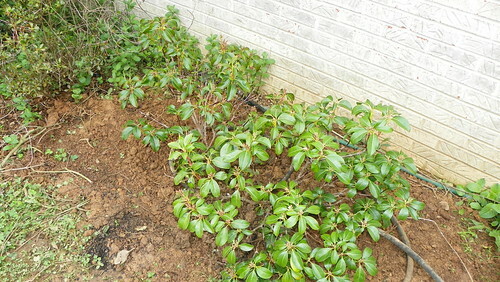 They spred and overtook the front planting, and did NOT respect the dwarf boxwoods planted around them. I may have to move them in the future. (Arghhh) They are so thick it is impossible to weed around them. 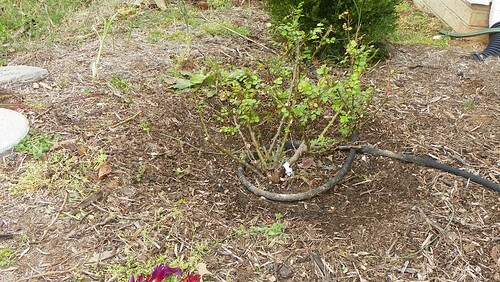 We moved the remaining shrub rose away from the front walk way so we wouldn’t have to prune it so heavily. 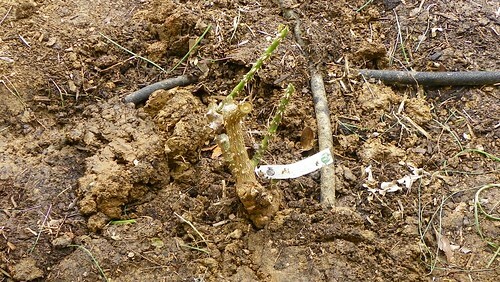 It’s companion had developed rose rosette disease and had to be removed last year. 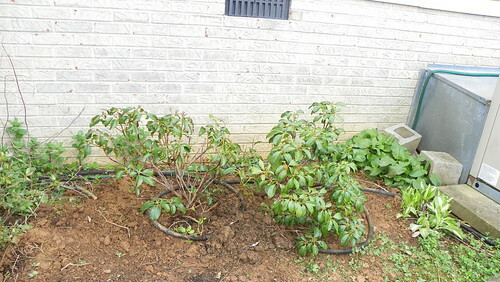 That leaves the front planting unbalanced but right now I don’t have plans to plant more. Our butterfly bushes will have more room to spread now. There is so much more to do but I have to get some commercial sewing done today so I hope the weather allows me to weed and start to mulch tomorrow. 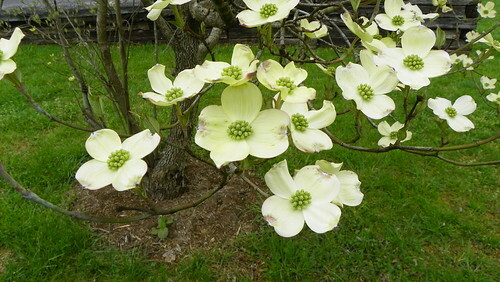 Posted in Gardening, Landscaping, Sewing, Work Clothes and tagged Gardening, Landscaping. Bookmark the permalink. I am filled with envy! The snow piles are now gone but yesterday we got another dusting of snow…although the weather at noon said it is now near 60 degrees! Michigan, my Michigan, you just have to accept her as she is… I’m looking forward to pictures of these same roses and plants later in the season to see how the pruning turned out!